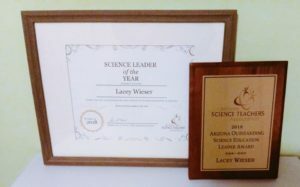 PHOENIX, AZ – November 2, 2018 – Wieser Learning Solutions is pleased to announce that Lacey Wieser has been named the Arizona Science Teachers Association’s Science Education Leader of the the Year. In 2018, ASTA recognized their first ever Outstanding Science Education Leader. This inaugural award was given to Lacey Wieser for her work as an advocate and leader in science teaching and learning and a strong promoter for all Arizona students and teachers. Lacey received this recognition during the Celebration Social during ASTA’s 64th Annual Conference, “Building Toward Phenomenal Instruction for All”. The Arizona Science Teachers Association has the mission of inspiring, engaging and supporting science teachers in preparing STEM learners for success. Visit the ASTA web page for more information about this organization.